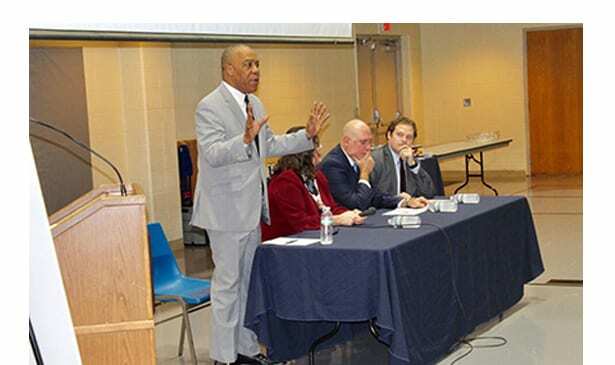 MEMPHIS, TN – “America has had a fixation on dope for a long time,” said Thurston S. Smith, laying out the facts to a group of community stakeholders attending a forum on opioid addiction Nov. 7 at Bartlett United Methodist Church. A behavioral health consultant and trainer, and member of the Shelby County Opioid Response Task Force, Smith shed light on the origin of drug abuse and its societal impact in America, past and present. The task force is comprised of experts and officials in Memphis and Shelby County charged with developing a plan to bring an end to the local opioid crisis. The plan is supported by the city, county, the Shelby County District Attorney’s Office, the U.S. Attorney’s Office, the University of Tennessee Health Science Center (UTHSC), and other agencies. Opioid addiction has become a public health nuisance and destroys too many lives – literally. It is spiraling out of control with deadly consequences that the Shelby County Health Department is trying to bring to an end. Recent figures compiled by the health department bear this out: opioid related emergency department visits in 2017: 901; opioid related deaths from 2013-2017: 650; opioid prescriptions for pain in 2016: 674,033. Drug abuse is costing America well over $500 billion annually “in criminal justice costs, lost work productivity, and health care,” Smith pointed out before joining other experts on a panel to take questions from the audience. Those who succumb to either drug, whether illicit or prescribed, often struggle at the onset of the addiction with eventual long-term consequences – even death. David Sweat noted that the average age of death in Shelby County from opioids is 40. “It’s hitting us on every level, every demographics, and all over Shelby County,” the chief epidemiologist for the health department said. Opioid addiction and other drug abuses can also lead to jail time, said Special Assistant U.S. Attorney Joseph Griffith. “We’re trying to encourage law enforcement not to arrest everyone,” he said. Except street dealers; they will be arrested, said Griffith, adding that it is much more costly to incarcerate someone than to treat their addiction. “There is no one way to treat addiction,” said Dr. Alisa Haushalter, director of the health department and associate professor of Advance Practice and Doctoral Studies at UTHSC. There is, however, a major gap in detox beds, said Dr. Haushalter, alluding to the difficulty of securing bed space for those who are drug-addicted. The faith-based community in this regard is called upon to do its part to help thwart the opioid crisis. Three stakeholders from the faith-based community comprised the second half of the panel discussion: Melvin Lewis, founder, The GAAL House, a transitional center for men recovering from substance abuse; the Rev. Jesse Johnson, program director of No Whispers Initiative at Christ United Methodist Church, touting a ministry that stands up for voiceless individuals currently struggling with mental illness and addictions; and the Rev. Pat Kendall, a pastor at Hope Church, who launched Hope’s recovery ministry 15 years ago and now comprising over 30 recovery and support groups. Lewis understands the need for intervention. He battled an addiction for 25 years before “God compelled me to help other men who are struggling with addiction,” said Lewis, now in his eighth year in recovery. The Shelby County Health Department is ground zero for the Opioid Response Task Force in terms of strategy and implementation. The county is chipping in $2.4 million the first year to implement the opioid response strategy map. The strategy includes launching a public awareness campaign, increasing affordability of evidence-based treatment options, creating an integrated data collection system, increasing access to and availability of Naloxone, and diverting individuals from criminal court into treatment and recovery.